This item nails the question. A number of described aliens will have no particular problem passing as a human being. Knowing that it follows that a number will in fact do so in order to gather general intelligence at the least. It is no more than we ourselves would do. From that it is clear that they would use the best effective camouflage. That has to include a holograph to cover the face. We already could do this ourselves today. Thus we have here conforming reports. Better yet they are simply using our services. This is not alien to them and suggests an unsuspected commonality of living needs. All good news in terms of future interaction. There could easily be thousands interacting. Assuming that they reside in deep underground facilities, this may be the only potential window of such interaction. again it is what we would also do. It has been reported that Earth's integration into galactic civilization is eminent. Thus more and more aliens are already getting boots on the ground. 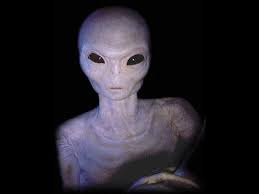 As our living spaces need never overlap this is quite reasonable..
“All of a sudden this woman (being massaged) turned into a very slender, very pale, kind of ash skin alien with big eyes and a very big head.” - Cindy Shilf, Professional Licensed Masseuse, Chicago, Illinois. “Myself and my two daughters had gone to the store. We were at Costco. We were approaching the food-court and my daughter had seen an old couple and she had kind of whispered to me, look Ma, I think they're angels (like a sweet, adorable dottering old couple). I don't know, I had a kind of a foreboding type feeling about them. I said, I don't think they're angels. We proceeded to go over. We ordered pizza. We were going to sit down with the pizza and, you know, the boxes at Costco are ginormous. One of the... the female said to me, you could sit at our table. We had more room to sit there and eat. I said, Okay. We ended up offering them a piece. And they said they had gone and the female had had an MRI done. They were checking her for brain cancer or a brain tumour or something like that. And I sparked a conversation because my daughter, she's 25 now had had brain surgery for brain cancer when she was 11 years old and we started talking to them a little bit and they declined the pizza offer because we had offered them food. So we just kind of talked to them a little bit. When they were getting up, getting ready to leave, I said, 'Hey, what is your name? I want to pray for you.' And she kind of stammered a little bit and as she stammered and stuttered a little bit, I saw what looked like a hologram over her face and through that hologram, I could see a head shape and I could kind of see, I could kind of make out features just a tiny bit, not a whole lot... but to me it looked like what people say a Grey looks like – a Grey alien. So after that, she told me her name was Ruth. And I don't remember them walking away. I don't remember non of that. The next thing I knew we were kind of, all of us we didn't speak about it at all.